There's no denying it, job hunting is hard work and people often become discouraged when prospects repeatedly turn up bleak. But the worst thing to do in a seemingly unpromising job search is to give up. The outcome of not finding a job in that case is certain but perseverance will eventually lead to a better end. For those who feel like throwing in the towel--don't--especially if you're using any of the following excuses to do so. There really is no good reason to quit a job search if there was any reason to begin one at all. The way you conduct a job search reflects how you'll perform once employed. The best way to avoid looking like a quitter is by not being one. False! Help is all around you if you can recognize it. If you're tapping in to the right resources, then you'll realize that assistance is available whether it be via the internet or your next door neighbor. If you don't know where to start, think about what you feel your search is missing and think about the best place you can go to find them. If applying to a company in an industry different your previous experience, you'll want a relevant reference. Try to get a LinkedIn connection within that industry as it may benefit you more than your buddy from the place you were last employed. Just remember that you're not the only one in this position therefore help is always out there. Yes, you do. Time never stops, only people and those who have time make it. Designating a certain amount of time at a specific time of day will prove the most helpful rather than doing it whenever you feel like it. Working that into your schedule will help your job search become routine. The same principle is applied to people who say that they don't have enough time to work out. By incorporating an activity into your normal daily schedule you eliminate the issue of making time for it. As your search progresses, your continued efforts are bound to produce results. Says who? Whether you feel that you lack some self-control or qualifications there is nothing stopping you from obtaining whatever it is you need--except you, of course. Set realistic expectations for yourself. Set goals you can manage and as you accomplish them start building on those goals with even bigger ones. 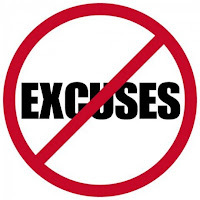 Implementing a no-excuses mentality is the perfect approach to achieving what you put forth for yourself. The most important factor in your entire job search is maintaining positivity throughout. Pessism will only hinder your ability to get anything done. Don't let feeling inadequate stop you from reaching your maximum potential in your job search. Everyone has what it takes, they just haven't proven it yet.